Your instructor will meet you at our new location at the published time of your course. If you're travelling to our office, outside of published course times, then please call to make an appointment (Our business office staff are also instructors and may be off-site providing programs to our many clients around the state; therefore ensure to make an apppointment so we don't miss you. You don't need an appointment if you are already registered for one of our courses). Courses for Everyone! At your location (or ours)! We offer many types of training to all areas of society. 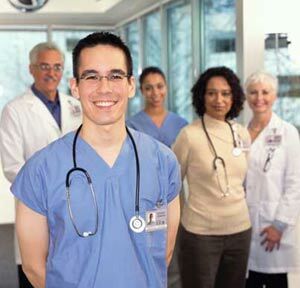 Whether you work in Healthcare, or not, we have programs for all. Our list of clients is over 25,000 (and growing). We provide training for Nurses, EMS, Physcians, Churches, Groups, Offices, Factories, and much more. If you are not able to find a program listed on our website, call us, we will likely have a solution for your training needs. What's more, we can often bring a program to your home, workplace, facility, or school! All of our instructors are licensed/certified/experts in their specialty. We hold accreditation from the New Jersey State Nurses Association to issue Continuing Nursing Education (CNE); additionally, we are an American Heart Association Training Center Site (a part of the Meridian Health System), an Authorized Prometric Test Center, a training site for the Society of Critical Care Medicine, authorized to provide the Emergency Nurses Association's Trauma Nursing Core Course (TNCC), and an authorized test provider for the National Healthcareers Association (NHA). Additionally, we are overseen by a board of directors who navigate our professional programs. Our parent organization is the Health Care Training Academy, which is a non-profit organization (registered 501(c)(3)). We hold many clinical affiliations with various healthcare facilities in the Central New Jersey area, and much more! The AHA now issues course completion eCards for its ACLS, BLS, and PALS programs. eCards have replaced printed cards, and because it can be accessed online, they offer many unique features, such as free re-printing of your eCard, should you need a replacement! eCards are issued within 48 hours of completing your course. eCards are now the standard card format for the AHA's ACLS, BLS, and PALS programs. Click here for information on claiming your eCard. Note: eCards will take approximately 48 business hours to issue. The AHA will email you directly; if you don't see an email from "eCards@heart.org", in your inbox, please check your Junk/Spam folder. Alternatively, you can search for your eCard by clicking here. If becoming an instructor seems daunting then rest assured we are well known for our exceptional coaching and mentoring throughout the instructor process. We have helped hundreds of instructors reach their goal. We identify potential and we will help you grow! Our Training Center Faculty are experts in resuscitation; moreover, our faculty are friendly and know to how provide you with the skills needed to succeed. Instructor credentials are great to have on a resume! The American Heart Association (AHA) will email your eCard, upon successful completion of an ACLS, a BLS, or a PALS course. eCards are electronic equivalents of the former "printed course completion card", and are valid for 2 years. See below for more info! 1) Complete the AHA online program (part 1) and print out your completion certificate. Contact us for the key to the online course. 2) Access our course schedule to view available course dates (skill evaluations are accommodated before a public course begins and are subject to availability). Other dates and times are available upon request. Call (732) 579-8690 to make an appointment for skills validation and pay the fee, or register online for any public course. 3) REQUIRED: Bring your online completion certificate (from step 1 above) with you to the appointment and give to your AHA instructor (the instructor cannot test your skills without this certificate). 4) At your appointment there will be time to practice (part 2) then you can take the skills testing portion (part 3) once you feel ready. 5) Upon successful completion of the skills test, you will be issued your AHA course completion eCard. We can provide programs at your home, office, shool, or facilty. Click here to Contact us for information on how to bring a program to you.